I really need to read Rules of Civility! it's been on my list forever. I've been wanting to read Rules of Civility and The Shoemaker's Wife! I'm so behind on books and everything thanks to college...ick. this weekend I binged and read The Engagements by J. Courtney Sullivan [I've loved everything of hers so far] and Wedding Night by Sophie Kinsella [she's totally a guilty pleasure author!]. currently I'm making my way through Wild, by Cheryl Strayed. 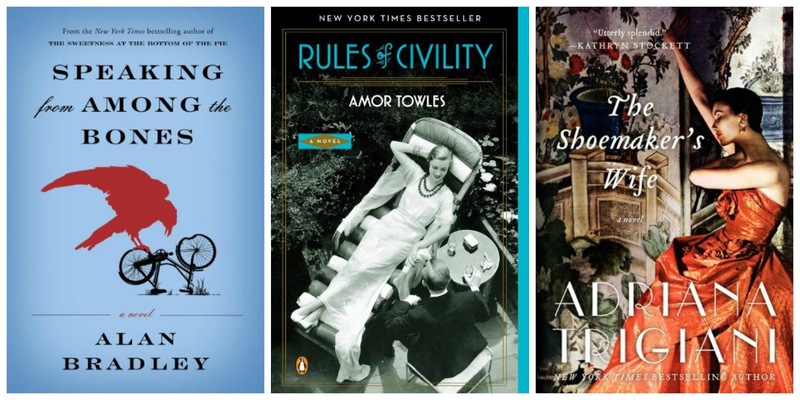 LOVED Rules of Civility - one of those books I didn't want to end (but luckily there is a sequel of short stories out that is called Eve in Hollywood). So glad to hear you liked it too. Currently loving In the Time of Butterflies by Julia Alvarez - lovely tale of rebellious sisters in a time of dictatorship. I have never heard of 'Eve in Hollywood' but will most certainly check it out! Thank you! Fantastic post Jay - I've been looking for new reads while I'm in Canada and can download them on my iPhone to read when I get back to Honduras. I just finished The Red Tent...I know I'm years behind, but it was still an incredible read! Gosh, I haven't heard of any these. Thank you for sharing! Now that I have the time to read again, I'm so excited to dig into these soon :) Shakespeare & Co, here I come! I've been looking for some new reads and these all look so good! Thanks for the recommendations! Okay, Rules of Civility might need to be added to my list. I love book posts! I've been reading a lot of the modern classics lately, with some silly YA thrown in there, too. It's always nice to get more suggestions! I LOVED Rules of Civility. I didn't realize there was a playlist to go along with it- I will have to check that out. Captain Corelli's Mandolin has been putting me to sleep all summer. It's slowly getting better...but I'm not in love with it. (http://www.judithwhitmore.com/) The book is packed full of romance, action, suspense, and some plot twists that I was not expecting! The great thing about this book is that it doesn't focus on the main character, Kate, being "rescued by a knight in shining armor" it focuses on the power and strength that she finds within herself after being stuck in a loveless marriage and having to deal with death and adultery. Kate meets Rick (who just happens to be a handsome, intelligent pilot) and this is just the icing on the cake :) I feel the book really promotes the idea of a female hero and it was quite inspiring to read! I highly recommend it!